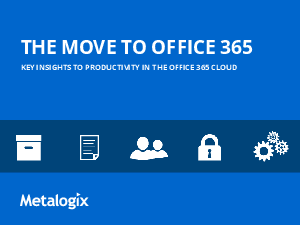 Microsoft Office 365 offers an easy path for moving to the cloud that boosts efficiency and productivity. Using services such as Exchange Online, SharePoint online and others enables organisations to set up productivity and collaboration environments quickly. It also frees IT from the time-consuming chores of maintaining hardware and software on-premises and speeds new application deployment. Read this white paper to find out how to plan for a Microsoft Office 365 implementation in your organization.